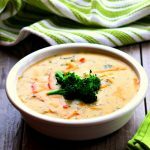 Reminiscent of Panera Bread’s broccoli cheddar soup this slow cooker version has chopped broccoli, shredded carrots and celery simmered in a velvety smooth cheese sauce. I believe this version is just as good or better than you could order at any restaurant! Try it for dinner this week. In a pan, melt the butter over medium high heat. Once the butter is melted stir in the diced onion and saute for 3 minutes. Add the onion to the slow cooker. Add in the celery, carrots, broccoli and broth. Turn the slow cooker to high. In the microwave or on the stovetop melt the 1/4 cup butter. Slowly whisk in the 1/4 cup flour until a creamy mixture forms. Stir one cup of the broth from the soup into the flour/butter mixture. Whisk until smooth. Then whisk the entire mixture into the slow cooker. In a small bowl stir together the cornstarch and water until smooth. Stir the mixture into the slow cooker. Stir in the milk, cheddar and salt and pepper. Cover and cook on HIGH for another 60 minutes. Remove the lid, ladle into bowls and serve.